The Varsity Match 2018 - Can Cambridge make it a double success again? George Dean is confident St Mary’s University can become a real force in University Rugby. The current 1st XV captain is part of the side which currently sits at the top of South B after five straight victories. St Mary’s have cemented themselves in the division for the last two years, but a 100 per cent start to this campaign indicates their ambitions in BUCS Rugby. 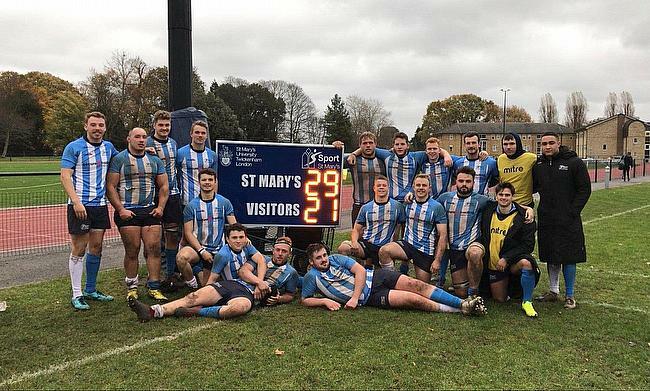 Last Wednesday, the London-based university moved to the summit after their 29-21 victory over Exeter 3rds and Dean, who is in his final year at St Mary’s, believes they are certainly heading in the right direction. “We are chuffed with how things are going this year and it is great to be at the top of our league at moment,” Dean said. Tremendous effort today by @StMarysRUFC @YourStMarys to overturn a hugely talented @ExeterUniRFC 29-21. Very proud of the performance of whole squad- great to see @ElthamiansRFC Academy boys @hobbs_o @aaronnkanang @ciaranmcgann13 @bobbybratton1 showing their class too. “We have a game in hand as well so beating Exeter 3rds, who are in second, was a really good result and another good step forwards for us. “Us and Exeter 3rds do seem to be in class of our own compared to the rest. It is a bit of a two-team league at the moment. Last season, we lost narrowly in all three games against them so it was a bit of a grudge match. “To be honest, we had the game in the bag at about 50 minutes, but one of our boys got yellow carded and we were under the cosh. The university's current progression can be attributed to their partnership with National One side Old Elthamians. The deal, which was announced in July of this year, aims to deliver co-ordinated educational and rugby opportunities to students as well as the club’s players and Dean is already seeing the benefits at St Mary’s. “It is unrecognisably different in terms of the professionalism this year,” added Dean. “Coaching has helped a lot this year. We have had two new head coaches come in in Pete Richards and James Brooks as well as Mike Friday, who is technically our Director of Rugby. “Pete sets very high standards. Sometimes it is quite challenging to work with! He kind of expects you to be full-time. We have gone from four hours to 16 hours a week this year. It is all change, but when someone comes in and sets those standards as far as he has, eventually, everyone gets there and we have. The partnership also allows St Mary’s to bring in players for their Scholarship Programme while some will also overlap and feature for OEs on the weekend in the National Leagues. St Mary’s is now seen as Old Elthamians’ academy and with OEs continuing to rise through the National Leagues, Dean feels their vision will only help the university establish themselves further. He added: “Old Elthamians are second in National One and they are a forward-thinking club and they want us to be too. You see the likes of Ealing signing a partnership agreement with Brunel University and that is the same sort thing. “The aim is to be a BUCS Super Rugby side and with OEs aiming for the Championship, they want us to be London’s top university for rugby. “A lot of the boys that go to places like Cardiff, Cardiff Met, Bath and Loughborough are London lads. There has never been a classically strong institution for them to go to in London so that is what we and Old Elthamians are trying to create. “We would be nowhere near what we are doing this season without OEs. The level of performance is well up there, especially with the players we have got. The plan is to bring in a number of new players on a scholarship next year. For now, St Mary’s are focused on promotion from South B and with two games left to play before the Christmas break, the Twickenham outfit are in an excellent position. St Mary’s face Cardiff 2nds this week before rounding off the year against Reading University, but since the beginning of the term, Dean says his side have only had one aim. “There was a single goal written up on the board at the start of the season and that was to get promoted,” added Dean. “It is not done and dusted yet, but we are almost there. If we can get a couple more wins, we can achieve what we want to. The idea would then be to push on to back to back promotions. “There is a real ambition and professionalism here and we have a good culture building. I am done after this year, but I wouldn’t be surprised to see St Mary’s mixing it with the big boys in two or three years time."